Oh, poster night! That magical time of year for politicos of all stripes to run amok around campus, making noise and donning war paint, all while frantically wallpapering our university’s visual landscape with smiling mugs, campaign promises and pleas for votes. But besides scrutinizing every campaign platform and every politico’s past performance, we at The Link also like to get into the superficial nitty-gritty, and respect our time-honoured tradition of analyzing the image content of the posters that are now saturating our hallways. I’m sorry guys, but way to play it safe and boring. It’s funny that a team that claims to have nothing to do with last year’s slate basically used the exact same poster with the exact same formula to try to convince me that they’re not the exact same party. Riiiight. What I see before me is that recognizable Vision/Fusion/Action tried, tested and tired “student politic” look, and it really makes me wonder if the slate simply opened last year’s .psd file and changed the colour to blue. That, and the fact that they didn’t even bother changing the gender lineup from last year (boy, girl, boy, boy, girl, boy, girl) makes me think that they were seriously out of inspiration here, and I hope that their platform isn’t as deliberate and premeditated. Admittedly, they’ve chosen a formula that’s proven to work. With years of successful marketing on their sides, reusing last year’s design isn’t a bad move. 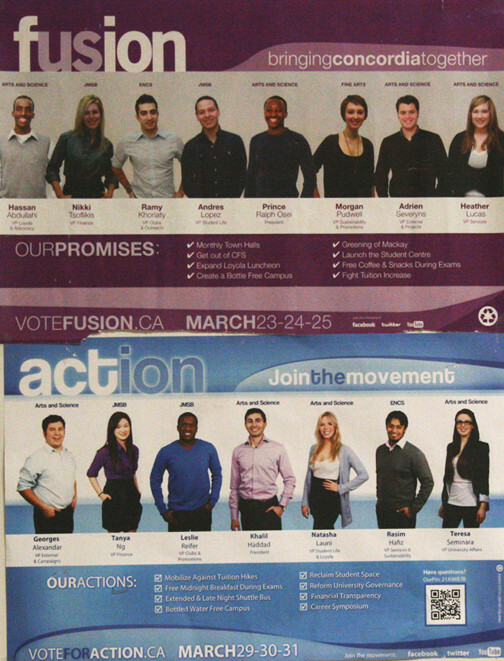 Plus, sticking to one colour will give them that easily recognizable look that helped the Obama campaign this year. Our initial reaction is that this is the slate with the better design. It looks professionally done, sharp, colourful, and they are clearly following the design trends of the day—not simply relying on any incumbent clichéd blueprint from politico poster night days gone by. On the individual councilor posters, the text seems to dominate, leaving the actual candidates looking like stock photos instead the engaged, impassioned political candidates they claim to be. That said, the posters that are all text appeal to us. They’re a bit edgier, and don’t rely on the dead, eyed-hand-hip-smile archetype we see so much from people trying to promote themselves. 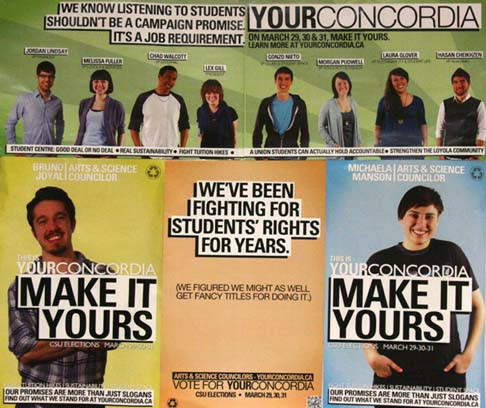 Unfortunately, students may not even notice the posters for the same reason we initially liked the design. They don’t fit the typical student politico template.